The Morrin Centre is at the heart of Quebec City’s history. 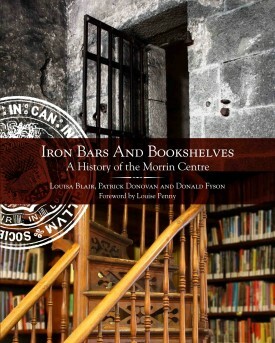 It once housed Quebec’s common jail, the Presbyterian-run Morrin College, and the scholarly activities of the Literary and Historical Society of Quebec. Today, it is home to the city’s main English-language cultural centre and library. The colourful stories of each of these institutions reveal unknown aspects of the tumultuous history of Quebec’s capital city and bring some of its forgotten characters back to life. This book takes you from the dark prison cells on the building’s ground floor to the stately library and college classrooms above it. Did you know that Quebec’s first French-language novelist, Philippe Aubert de Gaspé, did time in the jail, that Morrin College admitted women on equal terms with men some sixty years before Université Laval, or that the Literary and Historical Society of Quebec helped establish Canada’s National Archives? With a Foreword by Louise Penny. “This book is creative nonfiction/cultural history at its best. The illustrations are excellent and well reproduced. The appearance of the work is attractive. The notes and references are copious. Here is a world in a sense – a Quebec City that has enriched its present time by the preservation and adaptation of its past inheritance.” Sandra Stock, Quebec Heritage News. Louisa Blair is a writer, editor and translator. Author of The Anglos: The Hidden Face of Quebec City 1608-1850, she lives in Quebec City where she was born. Patrick Donovan is a doctoral student in history at Université Laval. He played an instrumental role in the restoration and establishment of the Morrin Centre from 2004 to 2009, including a brief stint as Executive Director. He lives in Montreal. Donald Fyson is a professor at Université Laval, specializing in the history of Quebec and Canada. He has published extensively on the history of crime, justice, and the law. On peut se procurer la version française chez Les éditions du Septentrion.